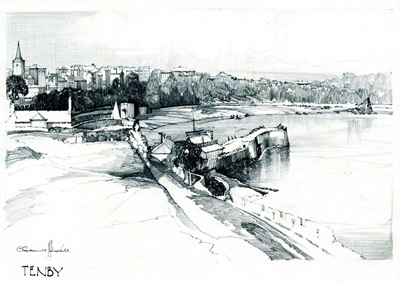 Claude Buckle captures, in his pencil sketch, the image of Tendby from just outside the harbour looking towards the town. Tenby is a walled seaside town in Pembrokeshire, South West Wales. It has some fine 3rd century medieval town walls and a Five Arches Barbican Gatehouse. Created in 1935.